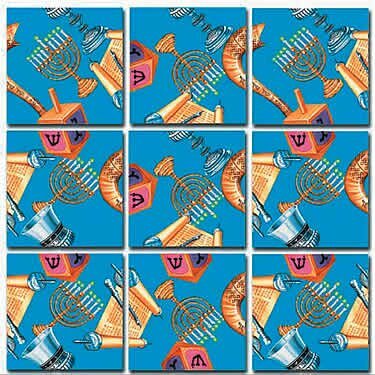 Judaica is the term used to describe the historical and traditional materials, symbols and literature of Judaism. The Torah is the central symbol and teaching of Judaism. It consists of scrolls containing the first five books of the Bible, known as the Five Books of Moses. Judaism teaches that the study and public reading of the Torah is a sacred duty of the Jewish people. The shofar is a 3,000 year old musical instrument which is quite literally a "horn" made from a ram’s horn. In ancient times, the shofar was used to trumpet important events, call armies into battle and proclaim kings. Today it is blown to proclaim the Jewish New Year in the synagogue by the ba’ al teki ah during the Rosh Hashanah service. A Menorah is a candle holder having separate places for eight candles and a ninth place for the shammash candle, which is the candle used to light the others. In observance of Hanukkah, Jews light one Menorah candle on each of the holiday’s eight days to celebrate the eight days that one drop of oil burned for the Maccabees in the lamp on the alter of the looted Great Temple in Jerusalem, the only synagogue of the time, after the Maccabees returned to Jerusalem from driving out the Syrians in 165 BC. Syrian King Antiochus IV had decreed that all Jews must worship the Greek gods and had erected alters to Zeus in the Great Temple and throughout Israel. Antiochus had banned all Jewish religious observances, burned Jewish scriptures and had his soldiers murder anyone who refused to worship Zeus. In 167 BC, Syrian soldiers came to the Maccabees’ village of Modin to convince their father, Mattathias, to sacrifice a pig at the alter of Zeus and to eat the pig’s flesh, another act strictly forbidden by the teachings of Judaism. Because Mattathias was a prominent Jewish priest respected by the villagers, the Syrians wanted to force him to renounce his own beliefs as an example to other Jews. Instead, Mattathias tore down the alter to Zeus and killed a Syrian soldier. He, his sons and followers fled into the hills and fought a successful two year guerrilla war against the vast army of Antiochus, fighting with farm implements, sticks and stones against elephant riding Syrians, armed with spears and swords. A dreidel is a four-sided top, having a Hebrew letter on each of its sides. Dreidels are used by Jewish children to play a popular Hanukkah game, a tradition which began more than 2,000 years ago when Jewish children, forbidden from studying the Torah by the Syrian King Antiochus IV, pretended instead to be playing games with tops while they recited memorized verses from The Torah in Hebrew. Kiddush is the melodic prayer sung over wine on the eve of every Jewish holiday and on Shabbat (the Sabbath, which is observed at sundown every Friday in the Jewish faith). The chalice holding the wine is referred to as the Kiddush cup. The kiddush cup is also prominent in the Passover seder dinner, which celebrates God’s freeing of the Jews from slavery in Egypt 3,300 years ago and their Exodus with Moses out of Egypt, across the parted Red Sea.